USDA nutrition surveys have found that as much as 75% of all Americans do not get the RDA of the nutrients they need. Finding the right multivitamin for your needs doesn’t have to be a difficult or stressful task. We looked at 20 of the most popular vitamins for adults on the market and considered their cost, pill count, included nutrients and amounts, extra ingredients, ease of swallowing (this will vary from person to person but overall some pills are easier to swallow than others), male/female specific formulas available and other considerations. The three choices we have listed below are the best of the best and excelled in all the categories we looked at. It is always recommended to get as much of your daily nutrients from your food as possible, but in today’s world of processed and fast foods, it is harder to get those nutrients from food alone. That is why a good multivitamin is a good idea to help balance what you are not getting from the foods you eat. If you look at the right factors and do some research, you’ll be able to narrow down the choices and decide on the right one for your nutritional needs. The purpose of the reviews below and the buyer’s guide following them is to help you navigate through the research process so you don’t waste time or money on the wrong product. A good multivitamin is one of the most common types of supplements that adults take on a daily basis. Since there are thousands of different formulas on the market, you will need to know what to look for when searching for the right one for your specific needs. SmartyPants may sound like a children’s vitamin company, and while they do offer excellent children’s formulas, they also offer high quality adult vitamin formulas as well. This Complete Adult Vitamin with Fiber is in gummy form. Gummies are a favorite of adults and children alike due to the fact that they are very easy to eat. 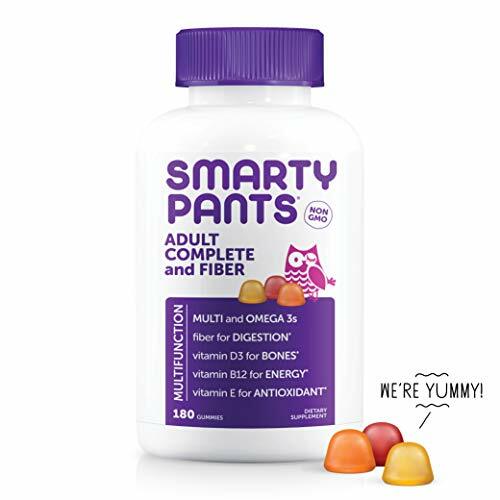 Premium vitamins are used in SmartyPants Vitamins, and they use the forms of each nutrient that are absorbed the easiest by the body as much as possible. They are allergen free, non-GMO, no artificial flavors, colors or preservatives either. They test all their batches to ensure the proper potency and purity and the testing is done by a third party. One of the really nice things about purchasing vitamins from SmartyPants is that they make a grant to Vitamin Angels every time someone purchases a bottle of vitamins. Inside this product there are ten of the most essential vitamins and minerals including D3, B12, Vitamin E, 6 grams of fiber that is soluble, omega 3 EPA and DHA fish oil all combined into one tablet. Gluten free, allergen free, no yeast, dairy, eggs, peanuts, shellfish, soy, wheat, tree nuts, artificial sweeteners, or anything unnatural. Nature’s Plus is a well known and trusted brand name in vitamins and supplements. These adult chewables have a delicious pineapple taste to it. This delicious taste and chewable form is perfect for adults and teens that have trouble swallowing pills. They are gluten free and can be taken by vegetarians as well. Taking one each day is fine for replacing some of the nutrients you may not be getting due to your eating habits and diet. There are 180 tablets per bottle which provide 180 servings. 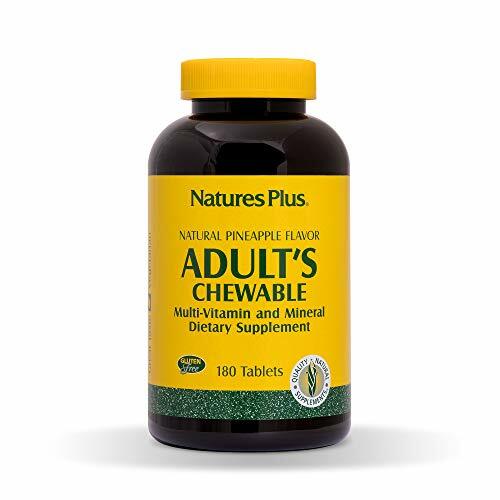 If you are looking for an easy way to supplement the nutrients you get from your food each day, Nature’s Plus has a variety of different formulas available but this adult multivitamin that is deliciously pineapple flavored is a great way to get the nutrients you need. Centrum has been around for decades, providing many different formulas for multivitamins for consumers to choose from. If you are over 50, Centrum Silver Multivitamin is a perfect choice for you to get the nutrients you need when you get older. As you age, your body will become more deficient in certain vitamins and minerals. Centrum Silver will make sure that you get the needed amounts that you may not be able to get from your foods. 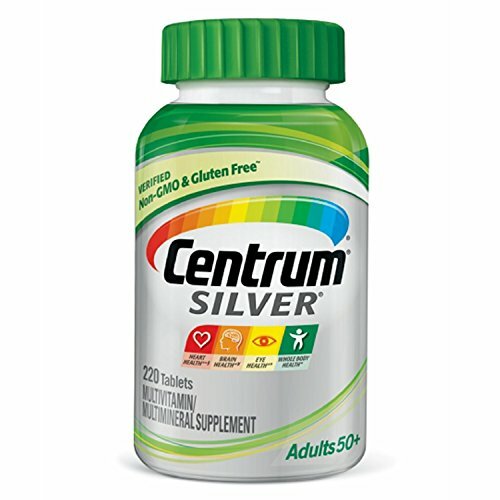 Centrum Silver offers support for bone strength in females and improves muscle strength in males. In addition to that, its new formula now offers the highest levels of D3 which is the type of Vitamin D. All of the key nutrients in Centrum Silver Adult Multivitamin are dedicated to supporting the health of your eyes, heart and brain. This brand has consistently been the #1 pharmacist and doctor recommended brand for multivitamins. You can choose from general adult, Silver, Men’s and Women’s formulas as well. The smooth coating on each pill makes swallowing them much easier. Centrum Silver Adult Multivitamins are not replacements for blood pressure or cholesterol medications. They are specifically designed to help the body get all of the nutrients it needs that is not coming from the foods you eat every day. Multivitamins are one of the best ways to supplement the nutrients you don’t get from the foods you eat. There are thousands of different formulas on the market to choose from which can make deciding on one formula pretty challenging. With the right information you can assess your own nutritional needs and decide which one is the best fit for you. The top rated vitamins for adults that we have reviewed above are all nutritionally complete and provide the essential vitamins and minerals you need to have more energy, have improved heart, brain and system health and be healthier overall. All three of these choices are cost efficient, easy to swallow or offer a great chewable alternative as in the case of the Nature’s Plus selection and will help you feel better and be healthier. To learn more about how to choose the best vitamin for adults, read our buyer’s guide below. This guide is full of information on what to look for, explains why and who would benefit from taking a multivitamin and what to watch out for in the way of unhealthy ingredients. This information will make it much easier for you to decide on the right multivitamin for your needs. There are many reasons that adults decide to take a vitamin supplement. These reasons will vary from person to person. Men and women have different dietary needs and a vitamin supplement can help you get whatever nutrients you need. There are many different formulas out there from generalized adult vitamins to vitamins that are specific to men’s and women’s needs. This guide is designed to help you decide which ones are the right ones for your needs. Women who are still able to have children need vitamins that contain iron to help with replenishing the iron lost during menstruation each month. You also want to take additional amounts of folic acid which will help reduce birth defects. Men need additional zinc and selenium that will help support healthy sperm function. Men do not need iron the way women do so you will not find iron in men specific formulas. Pregnancy is another important time for a woman to take vitamin supplements. There are many pregnancy vitamins on the market that help the growing baby with extra calcium, magnesium and zinc. Menopause causes changes in a woman’s body and can cause deficiencies so this is another time that vitamins can help. Bone health is very important during this time, so nutrients like calcium, magnesium, vitamin D, B12 and zinc are all excellent nutrients to get additional amounts of. Formulas for seniors are an excellent choice for a woman going through menopause. There is a lot of variation in the quality of vitamins on the market. Brand name recognition can mean a lot when it comes to making a choice. Reputable companies have good customer service centers that can help you with any questions you might have. In addition, look for companies that have put their vitamin and mineral supplements through testing. This testing ensures that the listed nutrients do not contain anything that is harmful and that they were manufactured using procedures that focus on sanitary and safe practices. Vitamins that have that USP verification can be additional reassurance of good quality. That there are no unwanted elements like flavors, sugar, colorings, etc. When you are looking for the right vitamin supplement, you want to make sure that there are certain nutrients in there that every adult needs. We have listed the required nutrients below that are important for your health. You want to ensure that the supplements contain 100% of the RDA for each nutrient. This will be listed on the label as well so you can see where that particular brand falls in the lineup. The only exceptions to this rule will be calcium and magnesium since for them to have the RDA included would make them way too bulky and large. There is not really a difference between all the different forms and deciding which form to use is personal preference. The body uses vitamins and minerals to help the body achieve its best health. They can also help regulate hormones. Although you can get many of your nutrients from food, vitamins for adults will help you supplement what you are not able to get. Vitamins are a great way for the body to get the nutrients it needs without solely relying on the food you eat. If there is any doubt in your mind as to whether you are consuming the nutrients you need in your foods, then taking a vitamin supplement would be a good idea. The information in this buyer’s guide is designed to help you know exactly what to look for and what to avoid when it comes to vitamins. There are so many on the market that it is easy to choose the wrong kind that won’t provide what you need. If you are unsure about the right vitamin formula for your needs, it is recommended that you consult with your doctor or a nutritionist who can help you decide on the right formula for your needs. Knowing which nutrients you are deficient isn’t always possible so taking a good multivitamin for adults is a great way to get the added nutrients you might be missing without having to go through a lot of testing and blood work.